*Provides precisely balanced nutrition to help your dog achieve ideal weight. 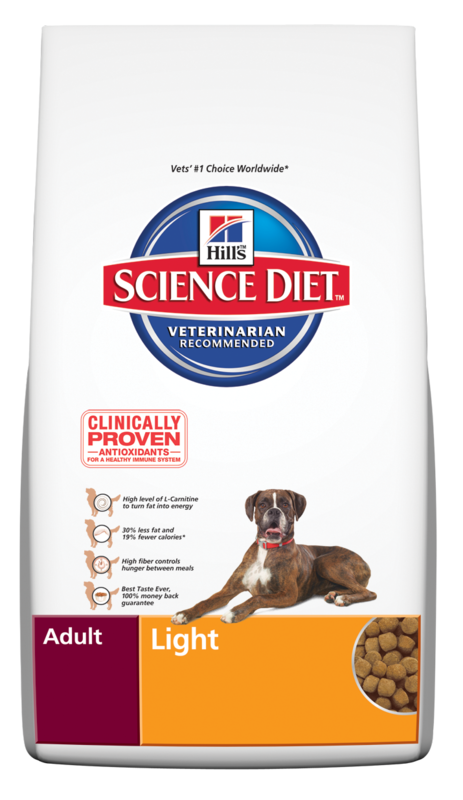 * Has fewer calories than Hill's® Science Diet® Adult Advanced Fitness Original formula to help control weight and contains L-Carnitine to help your dog turn fat into energy. *Has a high fiber content to keep your dog satisfied between meals. Pregnant or nursing dogs. During pregnancy or nursing, dogs should be switched to Science Diet® Puppy Healthy Development Original, Science Diet® Puppy Small Bites, Science Diet® Puppy Lamb Meal & Rice Recipe or Science Diet® Nature's Best® Chicken & Brown Rice Dinner Puppy, or Science Diet® Nature's Best® Lamb & Brown Rice Dinner Puppy.